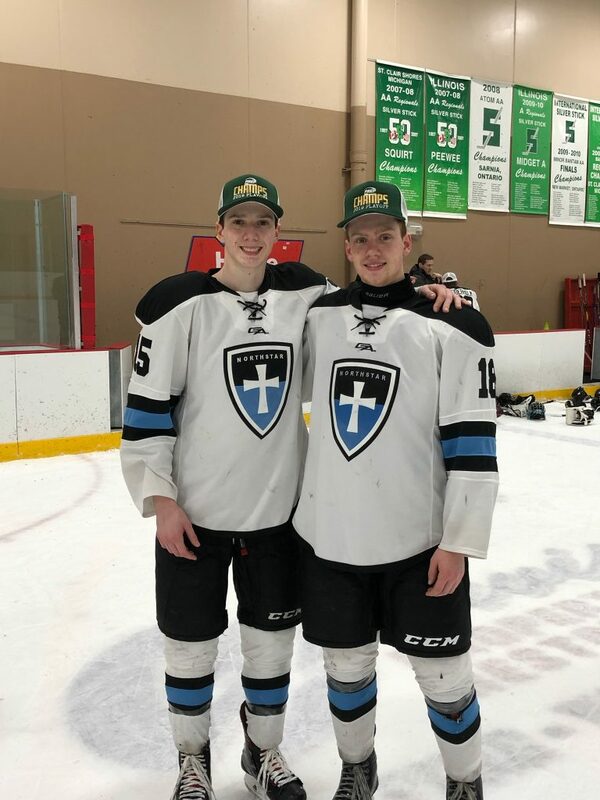 The Northstar Christian Academy Knights won all 5 games at the NAPHL Prep Championship in Troy Michigan over the weekend to secure the 1st ever NAPHL Prep Championship. The Knights won all 8 regular season games and then 5 additional playoff games during the league Championship week-end. These 5 wins extended the Knights unbeaten streak to 25 games (22 wins and 3 ties). After winning their first 3 preliminary games against St. Rita’s (CA), Lake Tahoe (CA) and Prairie Academy (SK), the semi-finals matched the Knights against the Fountain Valley Hockey School from Colorado. The game was hard fought with the Knights earning a 4-0 win. Key goals from forwards Jens Richards, Ben Casey and a pair from Zach Barros provided the offensive while Camdyn Barber earned the shutout between the pipes. The finals matched the Knights against the Pilot Mound Buffaloes, a growing hockey Academy in Manitoba. The Knights combination of a powerful offensive and a tough defense was too much for the Buffalo as the Knights dominated in all phases of the game. An early goal by Ben Strinden allowed the Knights to settle in until Connor Kemp scored on a shorthanded breakaway to increase the lead to 2. Alexandria’s Truett Olson added a pair of goals along with Pine City Defenseman Logan Johnson to push the Knights lead to 5-0. Earning the shut out in net for the Knights was goalie Collin Soderholm. The Knights will stay on the road and play 5 games at the University of Notre Dame this upcoming week-end including a key matchup against the Edge School from Calgary.